I'm long overdue for an update on my Autobianchi, aren't I? Well, the good news is that after a bit of trouble in the electronics department, the A112 did 50 mph screaming in third gear on an oval bike track built in 1928 with numerous other classics behind it. I bought my 1985 Autobianchi A112 in April, and since then I try to drive it as often as I can. It's not as easy as it sounds in a European city like Budapest where parking is impossible and public transportion is actually faster in most cases. That leaves the action for the weekends. Beautiful little two door. Never seen one here! In June, when all the other roads were closed, we went across the mountains to check out the flooding in Esztergom, a town on the bank of the Danube famous for – among other things – its Suzuki factory. It was a beautiful day. The sun was shining, the scent of strawberries filled the air as we were driving next to the fields full of people looking for the ripest ones, and apart from the long dead roof carpet finally giving it up by disintegrating into dust, the car was doing perfectly. On the way back though, it started coughing. I rebooted the system, and the problem went away. After arriving back to Budapest, it started fooling around again in the middle of the Elisabeth Bridge surrounded by heavy traffic. Not a good place to break down. I floored it, kept those revs high, and we made it somehow to the next red light. Then, the problem was gone once again. The next day, I took the car to Alex at Alfarium, and wished him good luck finding the ghost in the engine bay. He's good at finding problems. He found a few of them. I ended up $140 lighter but with a refurbished Weber carb up front. All good. In the beginning of this month I had to switch apartments. Not an easy job with a supermini, but the A112 is actually more practical than you would think. The rear seats fold down, and if you take out the hat-rack, there is enough space for boxes, a guitar and the numerous rubbish bags full of your stuff. Last Thursday after work, I went for another round. It all looked good. I parked the Bianchi in front of the old flat, ran up the stairs for the goods, then jumped in again and turned the key. Only to hear a clicking sound, and nothing else. I tried again, but the results were the same. After opening the hood, I checked the wires, but it was dark, I was tired, and it all looked okay. Dead battery? Alternator? Faulty wires hidden deep somewhere? I called Alex, told him what's up, then push-started it with some help from the driver behind me. The great thing about Alex and Peti of the Alfarium is that they actually care about the old cars they service and the insane people who keep them on the road. So, when I called them again, they left the party and arrived to the scene in 20 minutes with Peti's Alfa Romeo 166. At that point, I couldn't care less about the car, but a trip to the Velodrom was coming up in 40 hours and I was supposed to take part in it with the red monster. Alex just kept smiling and told me to just keep up the love, these things happen, and they will take care of the rest. So, we pushed it to life again with him behind the wheel and they drove off to their garage on the other side of the river. By then, it was almost midnight. The next day, I got the news that my alternator is dead. No big deal, it was supposed to be ready by the time I finished work. The problem was that the guy they usually take alternators to could only do the job on Monday. But he recommended another magician. The alternator that was supposedly fixed by that guy went back to the garage, only to give zero charge once again. At this point, I don't want to know what went down in their heads. But Alex started digging, and in the end, he found an Autobianchi part next to numerous others from Fiat 127s. The difference is that the Fiat doesn't have a voltage regulator. By 10 pm, my car was charging 14+ without the lights turned on. When I asked about the costs of this round, Alex wanted to charge me for 2 hours of labour. So yes, the next time I visit them, I'll bring some booze. 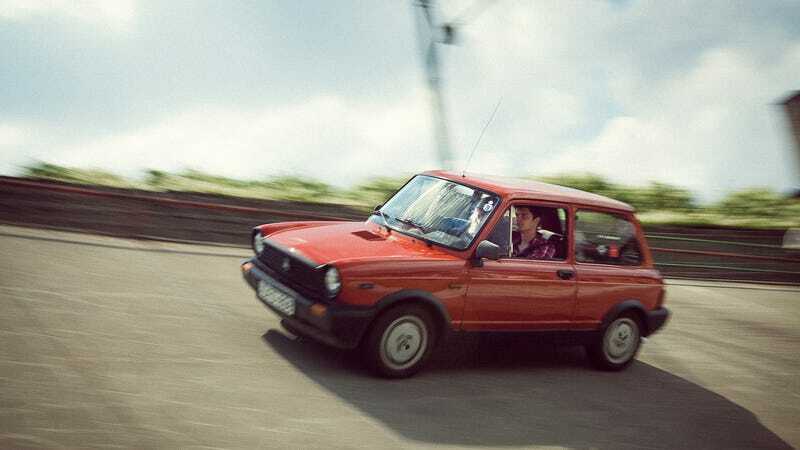 But just when I though they stayed late only to fix my car, it turned out that Alex's race-spec Fiat 127 had a puncture, and they were waiting for the replacement tires from the countryside as that car is using a size unknown to most men. The 127 was also due to be at the track the next morning. The slightly used Bridgestones arrived later that night. The Velodrom Millenáris is a classic vehicle meet at a century old oval bike track that has seen better days in the middle of Budapest. It's a place where people dress up in period clothing and if your car is under 2,200 pounds, you can drive on the track as well. The speed limit is 43 mph, but we did 50 to celebrate that my car works perfectly once again. Photo credit: Regenbach Zoltán, Mihálka Balázs + Bernáth Milán from Turbometal and Máté Petrány. Video by Bolla György from Tesztauto.hu. Thanks guys!